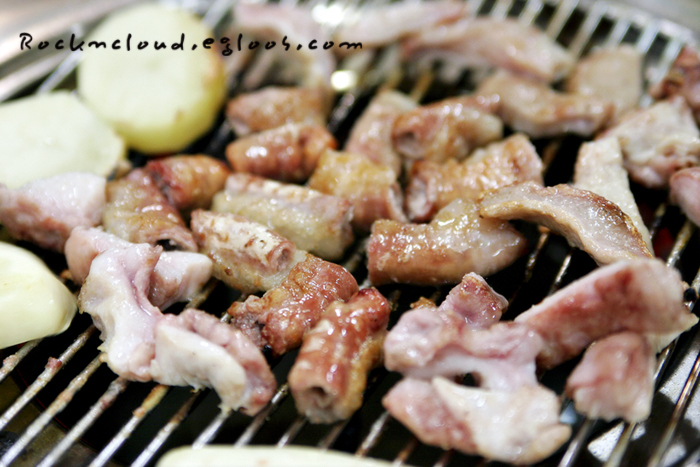 Makchang gui is the name of a Korean dish that consists of grilled pork (or beef) large intestines similar to chitterlings, but often grilled over coals. The small intestines are often called gopchang. They are often served with a light doenjang sauce and chopped scallions. High calcium content and high catabolism for alcohol makes it a favorite anju (side dish for drinking). Makchang gui is said to be originated from Daegu and the surrounding Gyeongsang region. King Seonjo of Joseon is said to have enjoyed the dish at his inauguration. Makchang is usually grilled over a barbecue, but preparation has to be done beforehand to rid the meat of odd odors and excessive fat. The meat may either be pre-boiled in water seasoned with doenjang, onions, medicinal herbs and such, or pre-marinated in a sauce made of various fruit (apple, Korean pear, pineapple, kiwi, etc.) before grilling. The dipping sauce is made from a mixture of doenjang, ground beans, ground red pepper, and chopped scallions. Fresh green and red peppers, cucumbers, minari and garlic are sometimes added according to personal taste. ↑ 2.0 2.1 2.2 Template:Ko Makchang gui, Maeil News, 2009-12-09. Retrieved 2010-06-25. ↑ Template:Ko Makchang gui, Naeil News, 2009-07-24. Retrieved 2010-06-25.